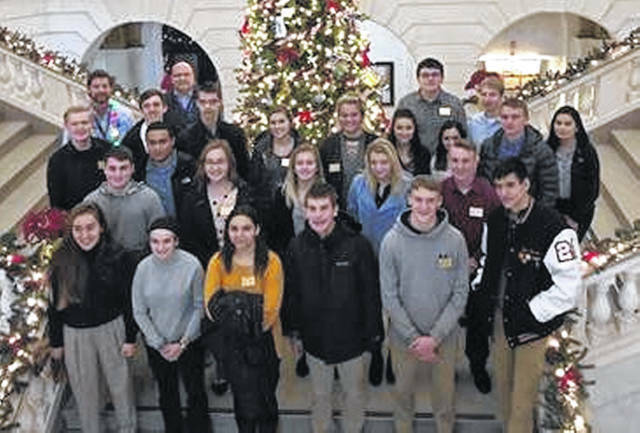 Leadership Clinton Youth Collaborative class members from Blanchester High School, Clinton-Massie High School, East Clinton High School, Laurel Oaks, Wilmington High School, and Wilmington Christian Academy gather in the rotunda of the Clinton County Courthouse. WILMINGTON — The Leadership Clinton Youth Collaborative met on Thursday, Nov. 29 at the Wilmington Municipal Building and the Clinton County Courthouse. The group discussed leadership within the county and city government and met local leaders. LCYC members toured the courthouse with Commissioner Kerry Steed and Waste Management Coordinator Jeff Walls. Students found the history of the courthouse to be very intriguing. Jeff Walls explained some interesting facts about the courthouse as it prepares for its 100th birthday in 2019. Decades ago, before its elevator was installed, the courts deemed the elevator shaft a city park so that money from parks and recreation could be used for the installation. Wilmington’s first city park (legally) was an elevator. Leadership Clinton also met with Municipal Judge Mike Daugherty in his courtroom. He showed an 11-minute introductory video to the group, a video he shows almost every morning in his courtroom. Daugherty discussed what it’s like being a municipal court judge, and did so with a quick sense of humor. Jermaine Isaac, Director of Wilmington Parks and Recreation, joined the discussion at the end of the day with a leadership exercise for the group. He discussed personal values with the groups and what those values mean to different people. Which values are common? Which are not as common? The Leadership Clinton Youth Collaborative learned the value of government leadership within Clinton County. The Clinton County Leadership Institute was created in the fall of 1986. Over 140 companies and individuals have sponsored more than 500 graduates in the adult program, and over 400 youth have graduated from the youth collaborative program, which began in 1994.